Firefighters at the "halfway" between Upper Squamish and Cheekye. Paid $0.25 / hour. 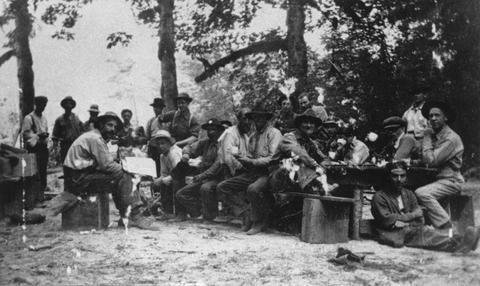 Seated far left, Mr Morbray (fire warden); seated left with white hat, Oswald (Ozzie) Ray; far right seated on bench, Charles Sherman Schoonover; seated next to him, Paul Sellons; standing far right, Compton Reade.